Carpets are notorious for becoming beds of dust and filth, and unfortunately the tools commonly used when cleaning said carpets are ineffective, wasteful, and some can even exasperate the problem. Dusty, filthy carpets have been proven to irritate those with allergy issues due to the fact that they are able to withhold a surprisingly high amount of pet hair. Other respiratory problems can pinpoint to messy carpets as the culprits. Even conditions like asthma can actually begin through prolonged exposure to carpets that haven't been cleaned very thoroughly, despite the client never previously showing signs of it. It is a serious health and safety issue that continues to be overlooked, and despite the extensive knowledge of these risks, most people are simply uninformed. 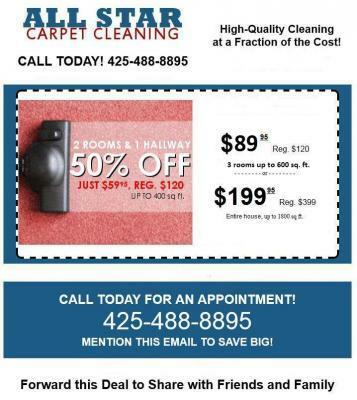 We here are one of the best carpet cleaning Kirkland, WA professional firms in the market. We fully understand the variety of carpets that exist out there, and know that each specific carpet must be treated differently. We also comprehend the risks of keeping a carpet dirty, or cleaning it via the use of unsatisfactory equipment. Our experienced and passionate staff member all have years of experience underneath their belts, so you can rest assured in the fact that when you hire us, you only hire the most professional in the business. We also guarantee that rates will be fair, whether you are a business hoping to sanitize the carpets in your entire business, or a lone home owner tired of kicking up hairballs whenever you walk along the house carpet. We cater to all sorts of individuals and carpet fabrics, meaning that the best carpet cleaning Kirkland, WA business will almost never come across a scenario that is completely new.